Guava trees from California Tropical are proven for successful long-term growth in Southern California and similar climates. 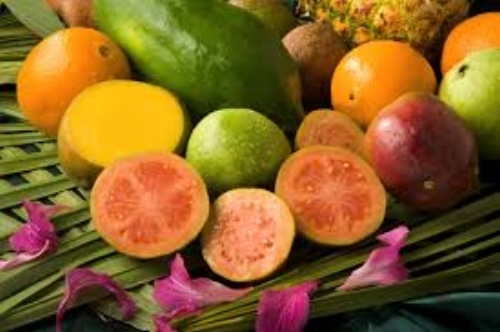 In addition to offering exceptional breadth and depth in its selection, California Tropical is uniquely positioned to supply Guava trees in a wide range of fruiting sizes, including rare large/mature-stage trees with instant and abundant yields. Guava trees are an ideal solution in creating a tropical oasis landscape as, in addition to their fruit, they are a perfect choice for partitioning and enhancing outdoor privacy. 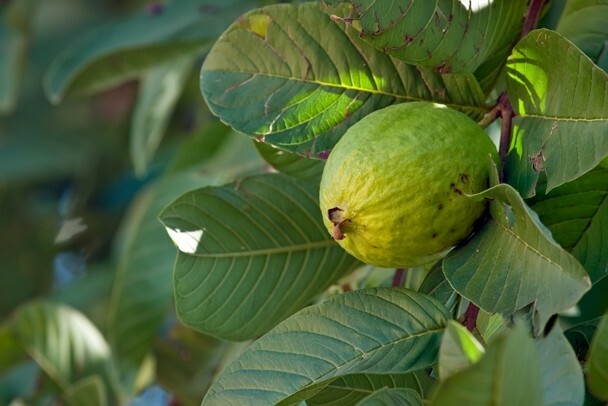 We encourage you to visit our nursery in Vista, California to explore our complete inventory of Guavas, and look forward to assisting you in the selection process! This unique variety is the “offspring” of a very large, pruned tree, and produces small, soft-skinned fruits with an intensly flavorful, sweet taste. The pale, yellow-skinned Mexican Cream has a unique and aromatic scent of pineapple and passionfruit. Its inside is creamy, white, thick and decandently sweet, making it a soon-to-be favorite healthy dessert. Native to the highlands of southern Brazil, eastern Paraguay, Uruguay, northern Argentina and Columbia, Pineapple Guava (also known as Feijoa) is a popular for both its fruit and ornamental characteristics. A small-sized evergreen tree, the Pineapple Guava produces egg-sized fruit that is highly aromatic in smell and taste, the latter of which is likened to a combination of pineapple, apple and mint. This dark red-skinned guava is very similar to the common Guava, but with an excellent juicy strawberry flavor. The exceptionally adaptable Red Strawberry Guava tree grows well in full sun and with ample water, although short periods of drought will not harm it. Softer than Southeast Asian White Guavas, this variety has chewable seeds and turns bright yellow upon ripening. 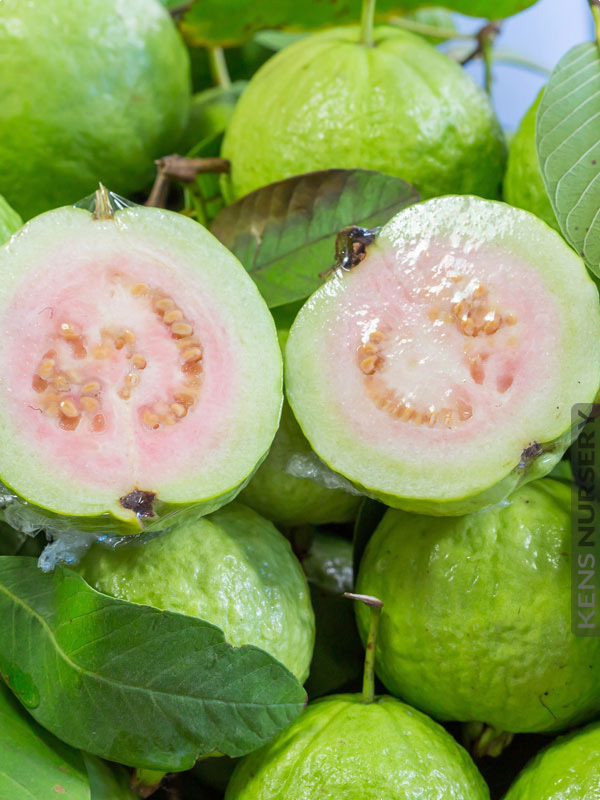 The Pink Guava fruit is mature in late spring to early fall, and is best when eaten fresh-picked from the tree, and before it is over-ripened. A very nice hybrid, the Ruby-X tree produces sweet and delicious fruit, with a thick skin that impedes fruit fly larvae. A small tree reaching 33 feet on average, its trunk is highly ornamental and its leaves are aromatic with beautiful, faintly fragrant white flowers. Ruby-X is exceptionally adaptable and does well in dry and humid climates. Producing rare red-ripening fruit, the Thai Maroon Guava is also an exceptionally ornamental tree, with deep red-hued leaves and lovely pink flowers that appear before fruiting. Thai Maroon Guava fruit, a Red Apple Guava cultivar, has a sweet, pinkish pulp that provides highly concentrated nutritional content. With fruit that is easily recognized by its yellow or green skin and sweet, juicy yellow or pink-blush flesh, the Yellow Sweet Guava matures at approximately 20 to 30 feet in height. Aptly named for its pear shape, the Pear Guava is also similar in size. It offers white flesh, small seeds and an exceptional flavor. Pear Guava trees are often used in ornamental landscape design, and can be pruned to size. They also flourish when planted as well as when they remain potted, making them ideal for smaller yards.